Nothing spoils a party like a swarm of mosquitos. At Skeeter Solutions, it’s our mission to stop these uninvited guests from showing up at your special event so you and your guests can enjoy the celebration. 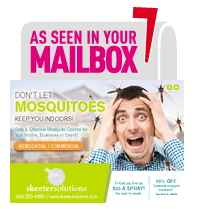 Whether you’re having an outdoor wedding in Daphne, a graduation party in Fairhope or hosting a family reunion in Mobile, Skeeter Solutions can work with you to create a customized plan to prevent mosquitos from showing up at your special event. We spray small, mid-sized and large properties all over the Gulf. Hosting a celebration in your own backyard? No problem. 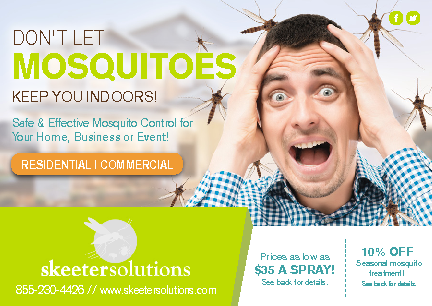 Skeeter Solutions can spray your venue well in advance of the big event so that you can set up chairs, tables and tents without fending off pesky mosquitos. Our mosquito sprays start working immediately and they’re safe for use around people and pets. Don’t let mosquitos chase away your customers. Skeeter Solutions can spray parks, recreation areas, pools and more so that your guests are free to enjoy what you have to offer. We also use our eco-friendly mosquito sprays at restaurants, amphitheaters and in public spaces. The active ingredients in our sprays are far more effective than even the strongest citronella candles or store-bought insect repellents. They’re also derived from natural sources; we use the same insecticide that naturally occurs in the chrysanthemum flower. Since it’s been proven safe and effective, this ingredient is often found in kids’ and pets’ shampoos, household pesticides and more. Whether your special event is right around the corner or you’re planning ahead, Skeeter Solutions can help ensure that you have a pest-free celebration. Our mosquito sprays start working right away and keep working for several weeks, enabling you to focus on what’s really important—your big event. When you call Skeeter Solutions, we’ll discuss your needs, your timeline and your schedule. We’ll carefully evaluate your property and find mosquito nests where they congregate and breed. Our highly trained technicians will eliminate mosquito “comfort zones” on your property and use an eco-friendly spray to kill both larvae and adult mosquitos. Call us at (251) 279-0345 to schedule your appointment with one of our special event experts today.